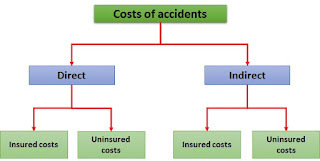 The occurrence of any accident will cause both direct and indirect costs. It is important that all of these costs are taken into account when the full cost of an accident is calculated. Different studies shown that indirect costs or hidden costs could be more than 30 times greater than direct costs of an accident. In other words, the direct costs of an accident or disease represent the tip of the iceberg when compared to the overall costs. These are costs that are directly related to the accident and may be insured or uninsured. any attributable production and/or general business loss. legal representation following any compensation claim. 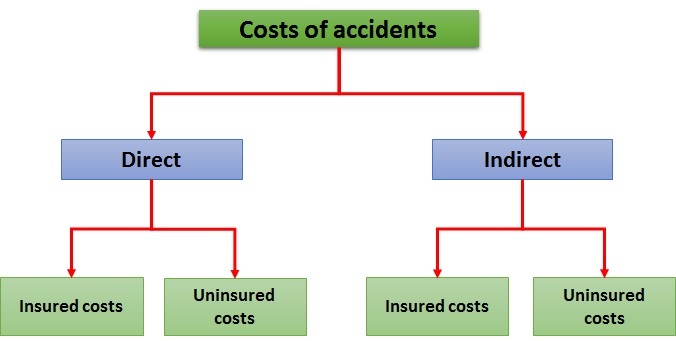 Indirect costs are costs which may not be directly attributable to the accident but may result from a series of accidents. recruitment of certain replacement staff. Some of the items mentioned above, such as business loss, may be uninsurable or too prohibitively because of the big amount of money required. 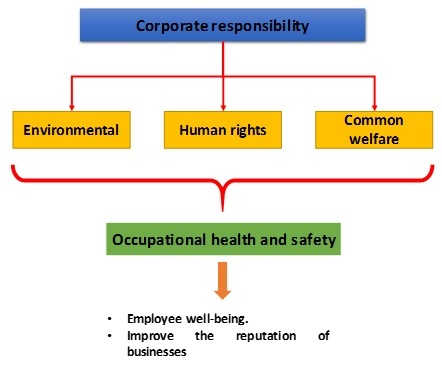 Related to the protection of the bodies and minds of people from illness resulting from the materials, processes or procedures used in the workplace. Related to the protection of people from physical injury. The borderline between health and safety is ill-defined and the two words are normally used together to indicate concern for the physical and mental well-being of the individual at the place of work. Related to the provision of facilities to maintain the health and well-being of individuals at the workplace. Welfare facilities include washing and sanitation arrangements, the provision of drinking water, heating, lighting, eating and rest rooms. First aid arrangements are also considered as welfare facilities. Is concerned with those illnesses or physical and mental disorders that are either caused or triggered by workplace activities. 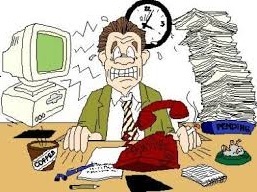 Such conditions may be induced by the particular work activity of the individual or by activities of others in the workplace. The time interval between exposure and the onset of the illness may be short or long. Related to the arrangements to cover those activities in the workplace which affect the environment and, possibly, the health and safety of employees and others. Defined as any unplanned event that results in injury or ill health of people, or damage or loss to property, plant, materials or the environment or a loss of a business opportunity. Is any incident that could have resulted in an accident. It’s a near miss which could have led to serious injury or loss of life. A hazard is the potential of a substance, activity or process to cause harm. Hazards take many forms including, for example, chemicals, electricity and working from a ladder. A risk is the likelihood of a substance, activity or process to cause harm. 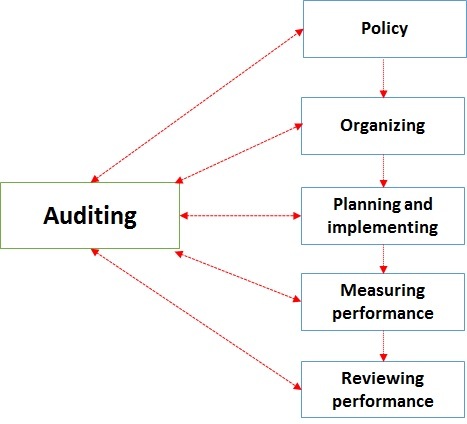 A risk can be reduced and the hazard controlled by good management. It is very important to distinguish between a hazard and a risk – the two terms are often confused and activities such as construction work are called high risk when they are high hazard. Although the hazard will continue to be high, the risks will be reduced when controls are implemented. The level of risk remaining when controls have been adopted is known as the residual risk. There should only be high residual risk where there is poor health and safety management and inadequate control measures. 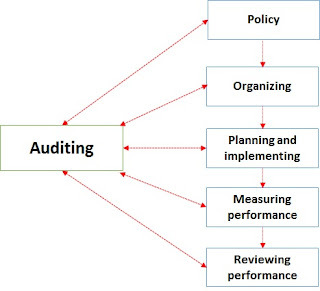 The industrialization process has brought a large number of problems; one of them is related to industrial accidents. With advances in industrial processes, new type of dangers to life, limb and health are being increasingly introduced. Everyday employees are injured in factories due to accidents. The accidents may be caused as a result on any kind of unsafe activity, or act in their part or chance occurrences, or as a result of some unsafe working conditions or unsafe act of employees themselves, or defective plant or shop layout. The pain and suffering of the injured as well as the emotional loss to the victims of the accidents causing permanent disabilities are impossible to be summed up and evaluated. What’s the definition of accident? The most agreed definition of accident is “It is an unplanned and uncontrolled event which causes or is likely to cause an injury”. 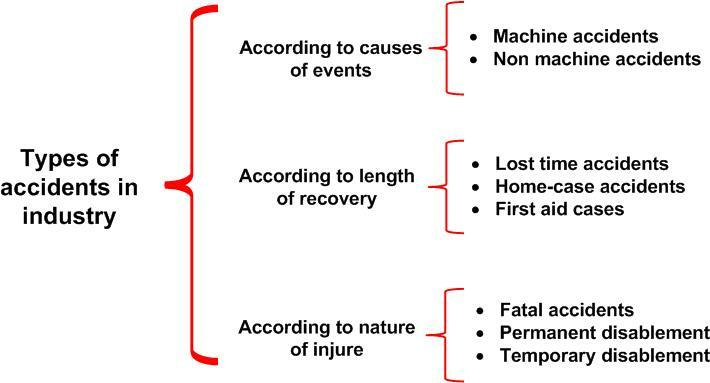 Accidents in industry can be classified using different criteria. Specific classifications are shown in the next lines. Ejection of particles: parts projected at high velocity from the machine, which causes serious injury when they hit the parts of the moving body. 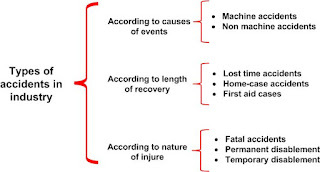 Lost time accidents: lost time accidents are those in which worker loses a day or shift in which accident occurred. These require payment of compensation to employee to employer. Home-case accidents: in this type of accidents, worker loses the remainder of shift or turn on which the accident has occurred. First aid cases: in these, workers receive first aid attention at plant hospital and then returns to their job. Fatal accidents: in which the worker or more are killed. Permanent disablement: which incapacitate an employee and makes it impossible for him to engage in any work, which was capable of performing at the time of the accident. Temporary disablement: this reduces the earning capacity of an individual in the employment.